Need to monitor your iPhone tethering on OSX? I’ve actually just written a bit of a brain-dump over a coffee break on where my head is at heading into tomorrow’s CRTC hearing – but it won’t pop up until later (I often bank posts to show up “in the future” to spread out my infrequent content. This freaks co-workers out when they think I’m blogging from meetings, airplanes, or 4am). Instead you get one of those rare geek-tastic “tech tip” posts! Batten the hatches. I wasn’t one of those people who was *incredibly* stoked about iPhone 3.0 tethering. It seemed like it was a nice feature, but I couldn’t think of a lot of times I would use it. Suffice it to say, it is now one of my favourite things in the world. At the airport and don’t want to pay $12 for wi-fi? Tether! Can’t get an Internet signal in your hotel room? Tether! Network goes down at the CBC? Tether! It’s a glorious, glorious, thing. However I was startled to learn that the iPhones “network useage” monitor does not include tethering data – so you have no idea how hard you are hitting your iPhone data plan… and as we all know… those things don’t come cheap. 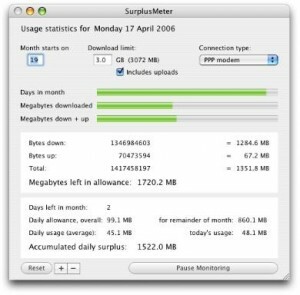 Take head OSX users, Skoobysoft’s surplusmeter is for you! This handy little OSX app will graph all network usage on *any* of your ports – and also project your usage for the month. It does the job, it’s unobtrustive, and it’s free (and considerably easier than most other suggestions which involve setting up proxy servers and examining the log files). I’ve tried this on all ports. I’ve yet to see any data usage reported. I’d be interested in hearing experiences from other users. Because the iphone shows up as an additional network device, I found I had to use the “network cards” setting to get it to show data traffic. Let me know if that helps. According to the support staff at SkoobySoft Support, tethered connections aren’t supported by SurplusMeter, but I will certainly try your suggestion. That’s so strange – as I had no problems getting an accurate data count (I downloaded a couple of files of a known size just to test it out). Perhaps there’s something non-standard with my networking configuration. Let me know if you have any luck – I’ll update the article proper. I am using the newest version of SurplusMeter and I have tried all possible Connection Types and can’t seem to get it to monitor tethering traffic. That is a shame because SurplusMeter is a great application. Me too, P4C. Can’t get nothing going.